The upcoming SAARC Summit, the third in Nepal after 1987 and 2002, is happening as Kathmandu suffers deep socio-political polarisations as it tries a second time to write the constitution. The national civil society is as if in stupor, while the political class is stretched thin and in poor position to lead the diplomats and bureaucrats. Narendra Modi has arrived like a meteor over South Asian skies, but we do not know if his imperious unilateralism will work in the South Asian regional context. Coming to attend the multilateral SAARC summit, he plans barn-storming events in Janakpur and Lumbini that the timid politicians of Kathmandu do not have the wherewithal to deny. (At press time, the two visits suddenly seemed to be in doubt). As the host nation on 26-27 November, and the SAARC chair till the next summit perhaps two years away, Nepal has the onus of tackling the Modi wagon in a manner as befits and benefits all South Asia. It is clear that, both personally and geopolitically, the new prime minister of India wants the neighbouring countries to achieve progress, but will he proceed consultatively? We do not yet know whether his forceful personality can function within the confines of the sovereignties of SAARC. Nepal is probably the ideal member-state to take up the chairmanship of SAARC at this sensitive hour of transition because it remains geopolitically the least-threatening among the larger countries of South Asia. The first thing obviously is for the observers of SAARC to realise its limitations, functioning as it does under the strait-jacket of consensus among eight foreign ministries. SAARC’s lack of dynamism reflects the reality of strident nationalisms among the majority post-colonial states of South Asia. We can disparage SAARC’s snail-pace, but we have to appreciate it just for being there, forcing the heads of government every so often to give the official nod to the concept of regionalism. In reality, it is not the governments but the civil society of our societies that will help build regionalism of the kind that soften borders and builds prosperity and peace. At the very least, the goal-setting in the SAARC Social Charter and the South Asia Free Trade Area represents aspirations, and if not at the regional then these can be achieved at the national and bilateral levels. The oft-repeated call for allowing discussion on bilateral differences between the governments of SAARC is a non-starter and it is best to shelve this suggestion till such time we have all matured. 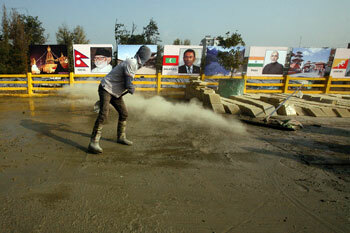 In the meantime, Kathmandu can take the lead in adding texture to SAARC. The most pressing need at the conceptual level is to define not only pan-regional (all eight members) but sub-regional (two or more members) activities as ‘SAARC’-related or ‘South Asian’. This simple demarche will inject adrenalin into the organisation, helping it represent the true diversity and energy of the Subcontinent. Simply put, SAARC is restricted in its scope by having to include each of the eight members in every activity, which leads mostly towards lowest-common-denominator initiatives. There are at least two Nepal-generated proposals before the foreign ministers when they meet to finalise the summit agenda. One is for SAARC to formally support the cooperative movement as an alternative basis for socially-committed action, distinguished from governmental action, the private sector, development donors and the non-governmental organisations. None of the member states should have a problem with this proposal. The other proposal which the trade unionists and labour activists of Nepal have strenuously lobbied for is a SAARC-level partnership to protect the millions of South Asian job migrants toiling overseas. This would be important for the migrant-sending countries like India, Pakistan, Bangladesh, Nepal and Sri Lanka. The big question, as always, is whether national pride and prejudice will keep India and Pakistan from agreeing to a joint SAARC platform, this one on migrant labour. The official theme for the Summit as suggested by Nepal is ‘Deeper integration for peace, progress and prosperity’, and the specific focus should be on infrastructural connectivity as a means of building stakeholders for regional stability. For this to have meaning, too, we must re-jig the SAARC formula to allow the sum of bilateral ‘connectivities’ to cumulatively promote regional goals. There are literally hundreds of urgent issues that SAARC must take up regionally and sub-regionally. One would be the ‘Asian brown cloud’, especially as India accelerates its use of low-grade coal. We need to collaborate on conservation of rhinoceros between Nepal, India and Bhutan; transit through Bangladesh for India, transit through Pakistan for Afghanistan and India are priorities. Some of these matters will be addressed in the People’s SAARC, a gathering of South Asian civil society on 23-24 November, and the day will come when what is discussed among the people will find its way into the formal agenda of SAARC summits and programs. It may even take decades, but SAARC will have ‘arrived’ when the governments of South Asia decide formally to address human rights abuse by state and non-state actors, and agree on a regional mechanism to deliver justice to the victims.